A simple way to serve omelets to many people at the same time. In a medium bowl, whisk the eggs well, then whisk in sour cream and cottage cheese until well blended but some lumps are fine. Stir in the cheddar cheese. At this point, you can store the mixture in the refrigerator and continue in the morning. Grease 6 individual ramekins Ladle the mixture equally among the ramekins. Bake in a preheated 350 degree oven for 20 minutes. As the omelets begin to puff and you can turn the oven off and let the residual heat gently finish cooking the eggs. Let cool slightly before serving. 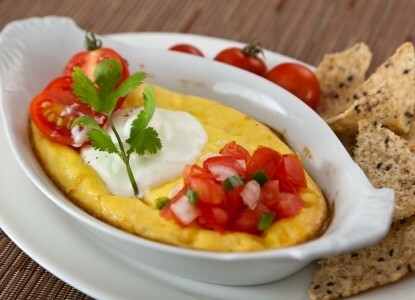 You can serve the omelets garnished with salsa, chopped green onions and sour cream. Or put these items in bowls and let your family garnish as they wish.